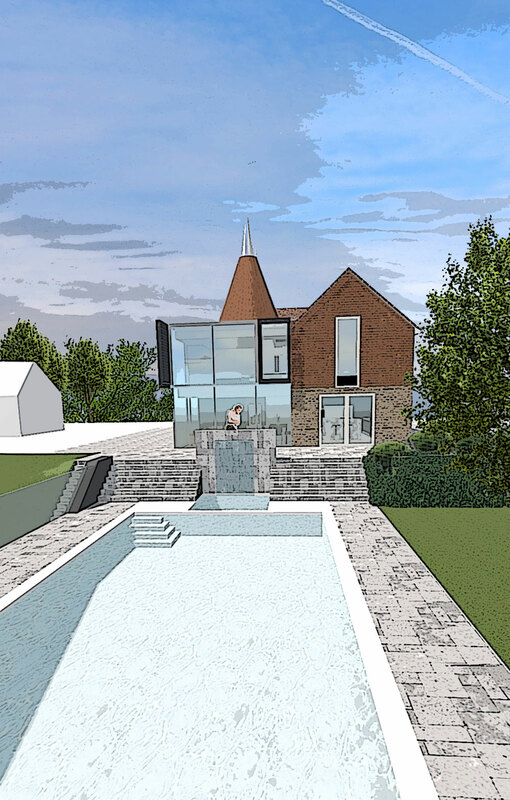 Planning permission was granted in May 2017 for the proposed extension and remodelling of this vernacular Oast house in rural Kent with a traditional / contemporary fusion design concept. An oast, oast house or hop kiln is a building designed for kilning (drying) hops as part of the brewing process. They are unique examples of vernacular architecture. They consist of a rectangular one or two storey building (the “stowage”) and one or more kilns, in which the hops were spread out to be dried by hot air rising from a wood or charcoal-fire below. In the early nineteenth century, the traditional oast as we now know it started to be built. A two or three storey stowage, with between one and eight circular kilns. Ash Oast consists of a 2 storey stowage with 2 circular kilns. The majority of oast houses in Kent have now been converted to homes and offices. The form converted and extended oast houses have taken, varies greatly from location to location. The quality of the convention , suitability of the architectural treatment and sensitivity to the oast houses mass, form and relationship to the kilns if extended is completely subjective. Dating from the mid 19th Century Ash Oast was converted during 1987 from agricultural to residential accommodation. Accessed via a private drive the Oast enjoys wonderful views over the Kent countryside from its elevated position with other Oast house kilns visible it the landscape. A peaceful position with expansive gardens and grounds extending to over 14 acres with wonderful panoramic views, Ash Oast is a unique building, in a unique location. At AV Architects we believe that the correct way to extend a historic building is to contrast the existing so that the beauty of the original building can shine through and be complemented by the new. At the pre-application site meeting the conservation officer for Tunbridge Well Borough Council raised some interesting points about the possibility of a modern contemporary extension to an Oast referencing aspects of traditional Oast stowage. With the design at Ash Oast we have tried to research Oast stowage design in greater detail. Our intension is to create an extension that has a level of transparency, responds to the unique requirements of our client, the limitations of the existing building but also incorporates familiar modulation and characteristics of stowages. As a practice prior to being commissioned by our client for the proposed works at Ash Oast we have been the architects for four other projects that involved works to oast houses from gaining planning permissions through to the projects successful completion on site, so we are reasonably familiar with the nature of oast houses. Create a defined main entrance to the building as currently on arrival it is unclear where one should enter the house. It is our clients preference not to have a kitchen within the circular environment that the roundels offer and therefore a further extension at the ground floor facilitates the kitchen moving from the roundel. The home has wonderful views from its elevated position, which the home currently does not relate to with the buildings fenestration focused towards the existing out buildings. 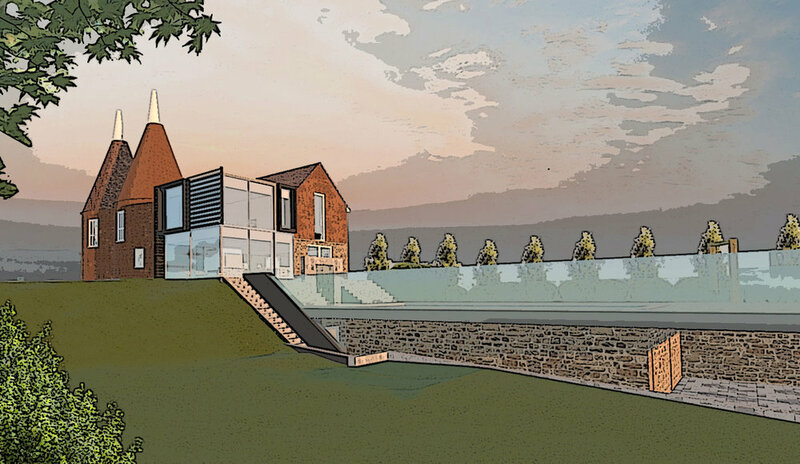 The proposed design incorporates large glazed areas to maximise views out. The proposals aim to retain the kilns as the dominant built form on the site. The new side extension shown in the image below is subservient to the kilns and contrasts the existing via its mass, materials and detailing. The extension makes the most of the views from the elevated position of the building and creates a clear entrance point to the building. Our aim is to retain and reinforce the character of the original buildings historic aesthetic by not trying to copy it, but to throw it into greater prominence by selecting a contemporary style for the side extension. 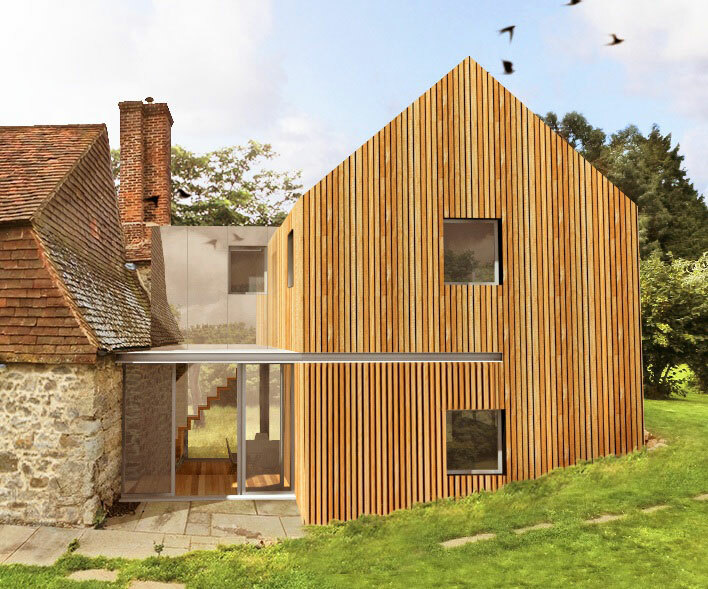 We consider Ash Oast shares similarities with another of our projects Crouchers Cottage. Both locations enjoy delightful views over the Kent countryside and have proposals where traditional historic architecture fuses with more contemporary elements to highlight the beauty of the original whist the quality and practicality of the new ensures the occupancy of the buildings for generations to come. 51 St Marys Road, Tonbridge, Kent, TN9 2LE.